Fullmetal Alchemist - Riza and Winry. . HD Wallpaper and background images in the full metal alchemist club tagged: photo fma fmab fullmetal alchemist brotherhood manga character riza ahwkeye lieutenant winry rockbell. 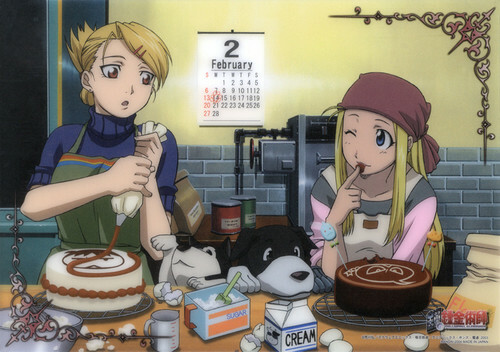 This full metal alchemist photo might contain buket, korsase, seikat bunga, buket korsase, nosegay, tanda, poster, teks, papan tulis, and cupcake.